While atten ding college in Manipal, Ramit Singal spent all his spare time carefully documenting the birds of the area. Ramit has now combined his sightings, photos and audio recordings into a book, with accompanying CD. You can read more about Ramit and his book A Birder’s Handbook to Manipal in these articles in The Hindu | Times of India | DNA | The Manipal Journal. Ramit has also written a lovely blog post on MigrantWatch, titled Manipal in the Winter. You can see Ramit’s 600+ MigrantWatch sightings and photos here, and his bird recordings are on xeno-canto. Manipal is a small town located in the Udupi district of Karnataka, and situated quite favourably at an equal distance from the Western Ghats to the east and the Arabian Sea to the west. 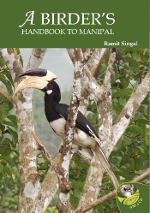 Manipal is best known for its university, but it is also endowed with a diverse range of habitats and, as a direct consequence, a diverse population of birds. The area hosts nearly 190 species of birds, a good 40 of which are seen only during the winter months. However, not all of them are migrants that cross international borders, or are palaeartic – many are local migrants or those that breed in the northern plains but winter in the south (Eg. Blue-tailed Bee-eater). In terms of migrants which are palaeartic – the number drops down slightly and becomes 30, still fairly impressive. This ’30’ includes all forms of birds – waders, warblers, raptors, etc but Manipal has thus far failed to attract any wintering waterfowl, despite suitable habitat being available. While I will get down to the nitty-gritties of the species and the frequencies of their sightings later, I want to put down a few words regarding the habitats in Manipal. There are three main different types of birding locales in this small town, all within one kilometre of the other. One of the most productive is the man-made Manipal Lake – a waterbody that dries up on the shores just in time for incoming waders to reap the benefits of the now available mudflats and vegetation. Another – and my favourite site in the region – is the Eshwar Nagar woodlands. These are basically the forests of yore, of which only a few fragments remain – the rest being grasslands (what were old paddies) or cultivation. However, there is just about enough in the area to keep it going and flourishing as a birdwatching site. Lastly, and the only site with any tourism in Manipal – End Point. 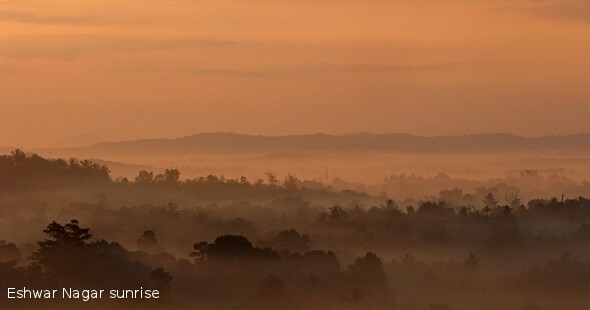 This region is the edge of the plateau between the ghats and coastal plains and comprises of scrubby laterite hillsides and secondary forests. 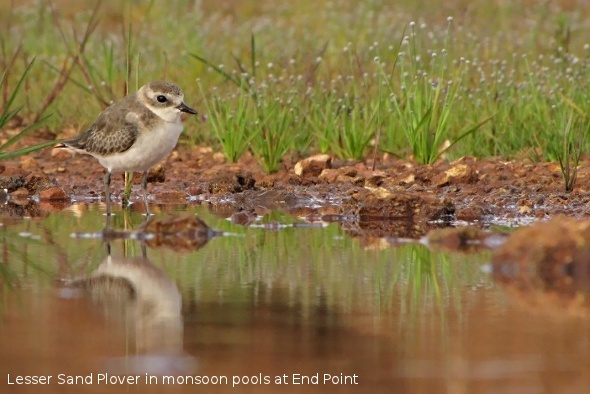 As the monsoons end in mid September and leave behind massive puddles in the laterite patches of End Point, the first waders – usually sandpipers and sand plovers are seen. They depart as soon as the water dries up, leaving behind the right habitat for the incoming flocks of Greater Short-toed Larks and other such birds – wagtails and pipits. The waders instead move on to the much wetter and much richer ecosystem of the Manipal Lake. Aggressive Ashy Drongos also start taking over every suitable perch possible. This is also the time when the open areas within forests get their first Brown Shrikes, which are noisiest at the start as they mark out their territories for the coming winter. By the time October’s first week ends, wintering and on-passage Brown Flycatchers, Bright Green and Greenish Warblers, Booted and Blyth’s Reed Warblers, and Barn Swallows can be seen anywhere – every garden and compound. 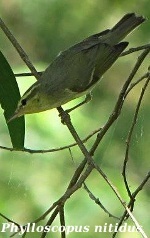 The Bright Green Warblers (subspecies nitidus of the Greenish Warblers; but often considered a separate species) are the most common winter migrants in the region, closely followed by the Acrocephalus/Hippolais warblers and Ashy Drongos. Amidst huge flocks of Chestnut-tailed Starlings, the Eshwar Nagar woodland throws up the most fascinating birds every now and then. Apart from the recent Broad-tailed Grassbird, the winters bring to it the odd Black-naped Oriole and varying populations of Oriental Turtle Doves. It also holds the largest numbers of Green(ish) Warblers and Blyth’s Reed Warblers – the latter probably because of the extra bit of moistness early morning :-). Almost 90% of all Brown Shrikes in Manipal winter in this patch and Marsh Harriers patrol the nearby paddyfields for the odd waders, crakes, and possibly Lesser Whistling Teals. The open grassland and scrubby vegetation that the laterite hillsides of Manipal naturally provide are good areas for the Common Stonechat – a regular but scarce visitor, a status it shares with the Tree and Blyth’s Pipits – both of which are also found in similar habitats (although the Tree Pipit does like the presence of trees around it a lot more :-). As the sun rises, the Booted Eagles also rise up with it. The Common Kestrel is a rare winter migrant here, this is the right habitat to find one. All of these arrive post mid-October in general. Due to human intervention, these same hillsides have been flattened at the top of End Point, but this move has put the habitat in good favour with passage flocks of over 500 Greater Short-toed Larks especially on return migration in February, as well as birds like the Grey-necked Bunting, which stayed for >3 weeks in Feb 2011, and Yellow and White Wagtails, the latter of which is the commonest wintering wagtail and is present in very good numbers from late November onwards. The Grey Wagtail is surprisingly rare, only seen around the discharge streams coming from the Manipal Lake. Manipal has several fields and grounds for sports that are used in the early mornings by birds. Their moist surface again brings together a few wagtails and waders – stints and Redshanks being especially fond of such habitats. Speaking of man-made habitats, of note perhaps is the Peregrine Falcon (subspecies calidus) that stayed for a week in October 2009 and perched regularly on the boys’ hostels in the engineering college’s campus! All in all, while the number of migrants may not be astounding, Manipal never fails to throw in a new surprise each winter. Its geographical location makes it an ideal place for getting the odd bird on passage between the extreme south and the west. All it really needs is more eyes to be on the lookout for any unusual sightings in its very varied landscape. Here are links to Ramit’s MigrantWatch sightings and photographs.